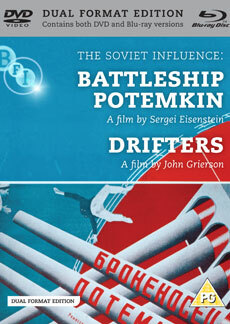 Exploring the influence of Soviet classics on 30s British film, this package presents Sergei Eisentein‚ classic Battleship Potemkin with John Grierson‚ documentary Drifters. The second in the BFI's series exploring the influence of silent Soviet classics on British filmmakers of the 1930s. This edition presents one of the classics of world cinema, Sergei Eisentein's 1929 Battleship Potemkin, in High Definition for the first time in the UK, and accompanies it with the world premiere High Definition release of John Grierson's ground-breaking 1929 documentary Drifters. Drifters premiered at the Film Society on November 10, 1929, on the same bill as Battleship Potemkin, which was receiving its British premiere. Grierson had previously produced an English language version of Eisenstein's film for its American screening and the influence of Eisenstein is clearly revealed in Drifters. Battleship Potemkin has appeared in every Sight and Sound film poll since 1952 and, in 2010 Empire Magazine voted it the 3rd greatest World Cinema film of all time. Drifters is presented with an all-new score composed by the talented young British musician Jason Singh. Battleship Potemkin presented in a new restoration by Film Museum Berlin and partners, accompanied by the 1926 Edward Meisel score. Drifters presented in a new HD transfer, tinted and toned as originally intended, with a score by innovative composer/performer Jason Singh. Granton Trawler (John Grierson, 1934, 11 mins): Grierson's follow up to Drifters, one of the GPO Film Unit's first experiments with sound. Trade Tattoo (Len Lye, 1937, 6 mins): celebratory animation made from off-cuts of EMB and GPO films, including Drifters and Night Mail. North Sea (Harry Watt, 1938, 32 mins): dramatic reconstruction of sea farers' battle with the elements, produced by the GPO Film Unit. Fully illustrated booklet with credits and essays by Henry K Miller, Patrick Russell and Michael Brooke. Granton Trawler (John Grierson, 1934). Trade Tattoo (Len Lye, 1937). North Sea (Harry Watt, 1938). All films presented in High Definition and Standard Definition.